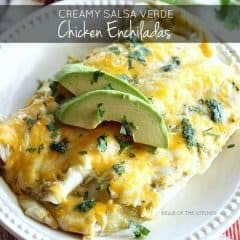 These Salsa Verde Chicken Enchiladas are made with a creamy and delicious filling, and smothered with cheese. They will kick any Mexican food craving! Happy Cinco de Mayo, Kenarry readers! I’m Ashlyn from Belle of the Kitchen and I’m back for a Mexican themed edition of Ideas for the Kitchen, a blog series where Carrie and I swap recipes once a month. When we found out this month’s exchange would be taking place on Cinco de Mayo, we decided to seize the day (dia?) 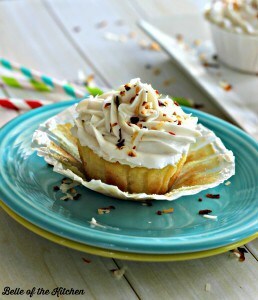 and give y’all some recipe ideas for your next fiesta! I’m bringing you a recipe for what is probably my absolute favorite food in all the world: Enchiladas! 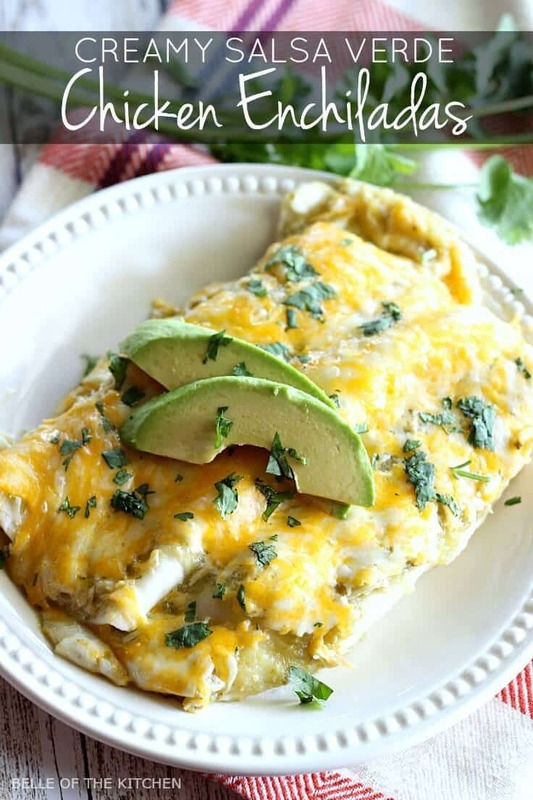 And these are extra special, because they’re Creamy Salsa Verde Chicken Enchiladas. If you’re looking for Carrie, you can find her over on my blog today where she’s sharing her recipe for Slow Cooker Shredded Beef Tacos. Since it’s Cinco de Mayo, I say today is the perfect excuse to nosh on all your favorite Mexican yummies. For my kids, that would simply mean eating a big bowl of “gock-uh-moe-ee” by the spoonful, with a few chips thrown in. But even my son, with all his picky ways, actually enjoys eating these enchiladas. He likes to eat the filling, and I really can’t blame him. It’s so so SO good! These Salsa Verde Chicken Enchiladas are very simple to prepare, especially if you use a rotisserie chicken to help save a bit on time. I love to buy our rotisserie chickens from Costco because they are only $4.99!! I mean, you just can’t beat that! The filling is made with onions, garlic, green chiles, and chicken. It’s nice and creamy thanks to a little cream cheese, too. I like to wrap these enchiladas up with either small or medium sized flour tortillas, but you can also use corn tortillas if that’s more your style. Once these are done baking, sprinkle on a little cilantro and top with some sliced avocado and you are ready to eat! So how do you plan on spending your Cinco de Mayo? Are you headed out on the town, or staying in and enjoying a little fiesta at home? Let us know in the comments! We’d love to hear what you’ve got planned. Preheat oven to 350 degrees. Spray a 9x13 baking pan with cooking spray and set aside. Melt butter in large skillet over medium heat. Add onion and cook for five minutes, until softened. Add in garlic and cook for 1 minute more, until fragrant. Stir in cream cheese, green chiles, and chicken. Reduce heat to medium-low mixing constantly until cream cheese is melted and mixture is combined. Pour a small amount of green salsa (about a 1/4 cup) into the bottom of prepared baking dish. Divide filling evenly between 8 tortillas, about 1/3 cup each. Roll tortillas and place them seam side down in the pan. Cover enchiladas with the remaining salsa and sprinkle with cheese. Cover pan with foil and bake in the preheated oven for 25-30 minutes until cheese is melted and bubbly. 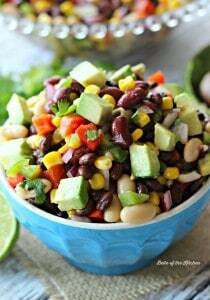 Sprinkle with chopped cilantro and serve with sliced avocado. Thank you so much to Carrie for having me over to visit! I’ll look forward to coming back next month with a new recipe to share with all of you. I’m from southwestern New Mexico (just 4 hours from the Mexican border), so Mexican cuisine is a staple in my kitchen. Definitely corn tortillas though – it’s almost unheard of that close to Mexico to make anything except burritos with a flour tortilla. We also tend to use sour cream instead of cream cheese, but I’ve seen a lot of recipes that use cream cheese, so I think I’ll have to try it that way. Thanks, Stephanie! I hope you enjoy the recipe. 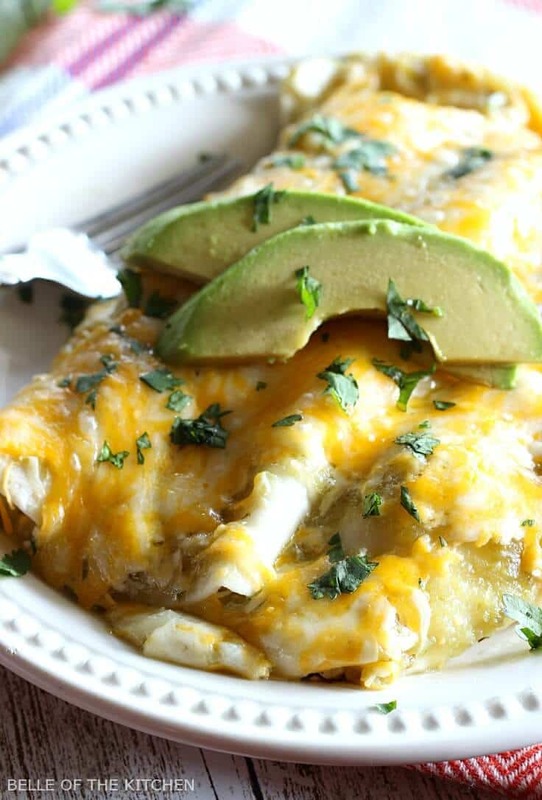 Let us know what you think of the cream cheese in the chicken enchiladas instead of sour cream. Enchiladas are seriously one of my fave foods on the planet, so finding new variations is always exciting! One of my favorites right now are Thai Chicken Enchiladas but this Creamy Salsa Verde one will definitely be coming into rotation! 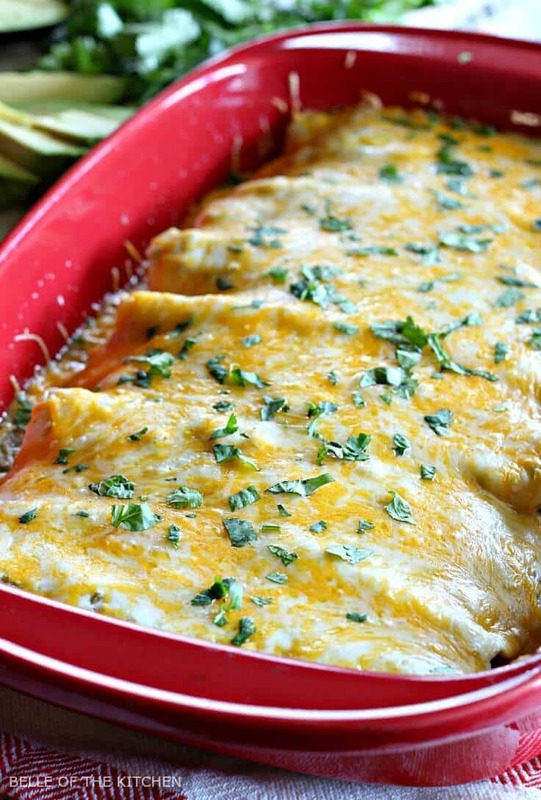 Ooooh, Thai Chicken Enchiladas sound amazing. 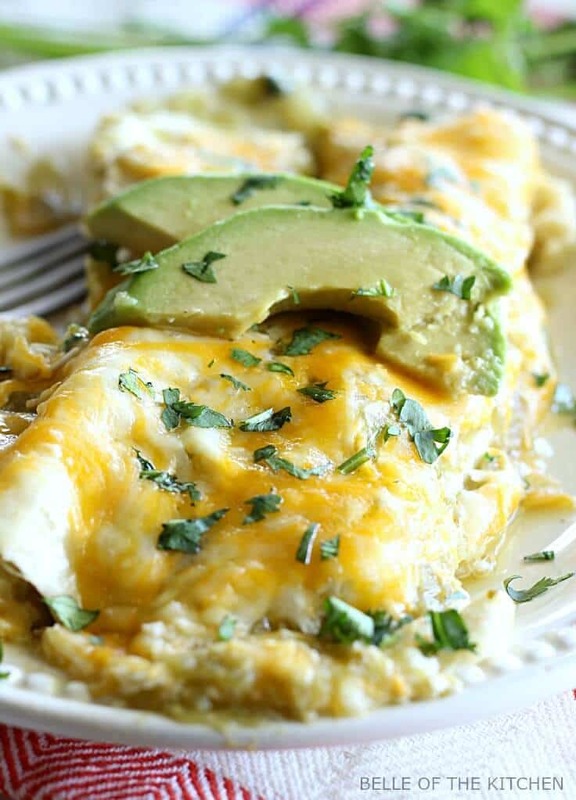 Hope you enjoy these Creamy Salsa Verde Enchiladas from Belle of the Kitchen, Erica.